HMH Books for Young Readers, 9780547152318, 80pp. Without honey bees the world would be a different place. There would be no honey, no beeswax for candles, and, worst of all, barely a fruit, nut, or vegetable to eat. So imagine beekeeper Dave Hackenburg’s horror when he discovered twenty million of his charges had vanished. Those missing bees became the first casualties of a mysterious scourge that continues to plague honey bee populations today. In The Hive Detectives, Loree Griffin Burns profiles bee wranglers and bee scientists who have been working to understand colony collapse disorder, or CCD. In this dramatic and enlightening story, readers explore the lives of the fuzzy, buzzy insects and learn what might happen to us if they were gone. Loree Griffin Burns, Ph.D., did her doctoral at the University of Massachusetts Medical School. Ms. Burns lives in Massachusetts with her husband and children. 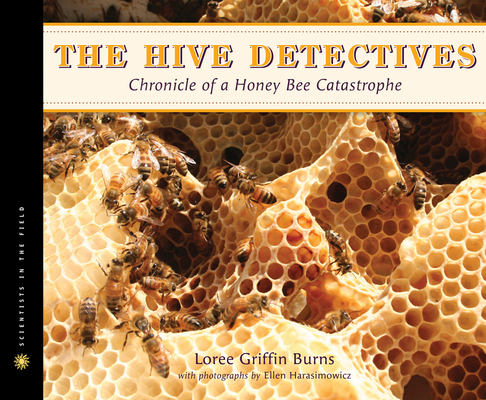 She is the author of Beetle Busters,Tracking Trash, and The Hive Detectives. Learn more about Loree at loreegriffinburns.com and follow her on Twitter @loreegburns. Ellen Harasimowicz is a freelance photojournalist new to nature photography. Her work has appeared in the Boston Globe, the Washington Post, and Scientific American. Ellen lives in Massachusetts with her husband, Paul; her work can be seen at ellenharasimowicz.com. Follow Ellen on Twitter @ellharas.